Iranian human rights activists say several teachers arrested for staging a protest in Tehran have been sent to the city's Evin prison, known for its jailing of political dissidents under harsh conditions. The activists said the teachers were jailed at Evin after participating in a peaceful demonstration Thursday outside the Iranian government's planning and budget office building in Tehran. That rally was one of at least 30 held across Iran by the Coordinating Council of Iranian Teacher Trade Associations to protest what it sees as poor salaries for teachers and poor government funding of education as a whole. Activists who witnessed the Tehran rally said dozens of retired and active teachers participated peacefully before plainclothes security forces broke up the gathering, beating up some of the protesters. Iran's state-run ILNA news site said six protesters were detained, while the Human Rights Activist News Agency (HRANA) that gathers information from inside Iran put the number at 15. A board member of the Tehran Teachers Association that organized Thursday's rally said she saw five of those arrested - all men - appear in a court on Friday, handcuffed and shackled. In a Friday tweet, Sedighe Pakzamir gave their names as Abedini, Bodaghi, Falahi, Garami and Hosseini. She said their wives also saw the men but had only a short amount of time to hand them their medications. Amsterdam-based news outlet Radio Zamaneh said the detainees each had been offered a $12,000 bail but refused to pay. Pakzamir said a sixth man detained on Thursday, her fellow board member Mohammad Habibi, was nowhere to be found. Habibi previously had been released from Evin prison on April 15 after being detained on March 3 for unspecified charges that drew criticism from global and Iranian rights groups. Iranian Education Minister Mohammad Bathaei posted a tweet on Friday, saying his department has been cooperating with "relevant authorities" to try to resolve the arrested teachers' situation. 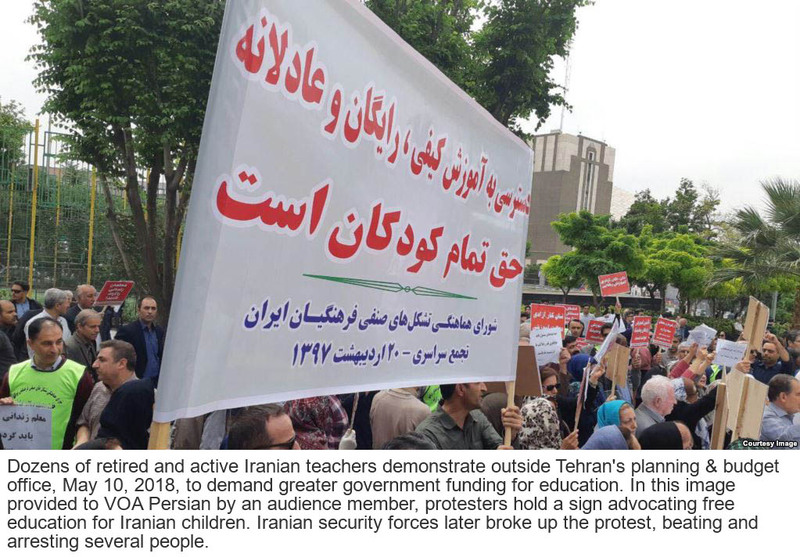 But Bathaei said the Tehran teachers' protest did not have a permit and called it "unfair and unwise, given the current political situation of the country." 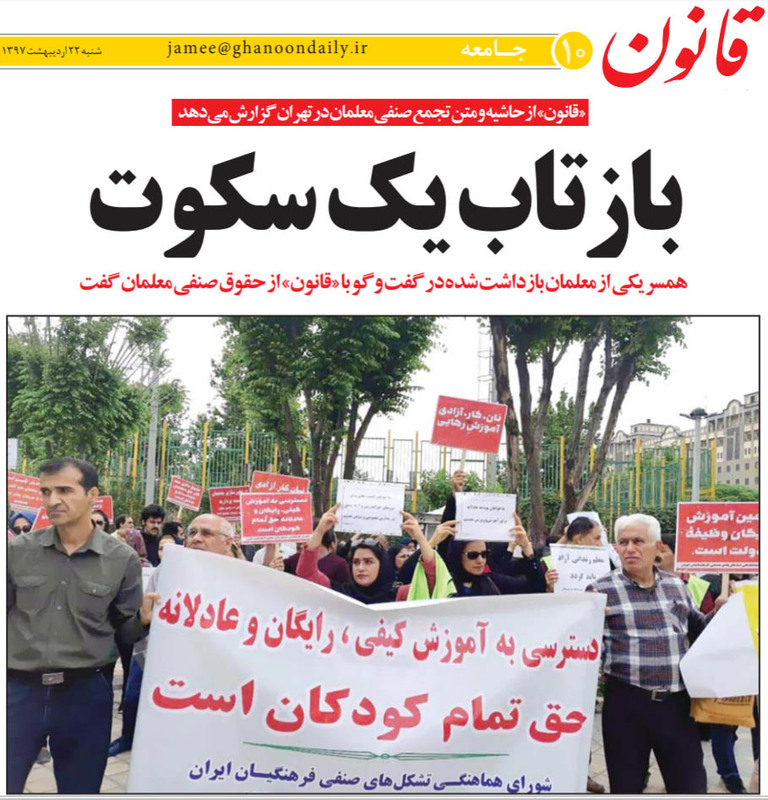 HRANA said the Tehran Teachers Association issued a statement condemning security forces for attacking the teachers and calling for the immediate and unconditional release of those detained. Shahram Bahraminejad and Behrooz Samadbeygi of VOA's Persian servicecontributed to this report.